Known for his insane laser creations, laser modder and YouTube personality Drake Anthony, aka Styropyro, is back with a new project in honor of the latest Star Wars movie. To keep up with the growing number of lightsaber DIYs on YouTube, Styropyro decided to join in on the fun by upgrading his 3W handheld lightsaber from a few years ago to an impressive, if dangerous, 7w version. The 7W homemade laser quickly lights things on fire and can blind you instantly and permanently if misused. Styropyro provides a quick overview of the laser-emitting device in the video, but falls short of detailing how he built it, leaving that information for curious DIYers to find in his earlier videos, the laser-point forums, or other laser-enthusiast sites. The 7W laser lightsaber was created using a blue Nichia GaN laser diode that was overdriven to 7W using a few buck drivers connected in parallel. He added two lithium-ion batteries to power the device and an anti-reflective coated glass lens to focus the beam. With all the parts in hand, he packed the components into a lightsaber-shaped host and assembled a powerful handheld laser that’ll scare and impress people at the same time. 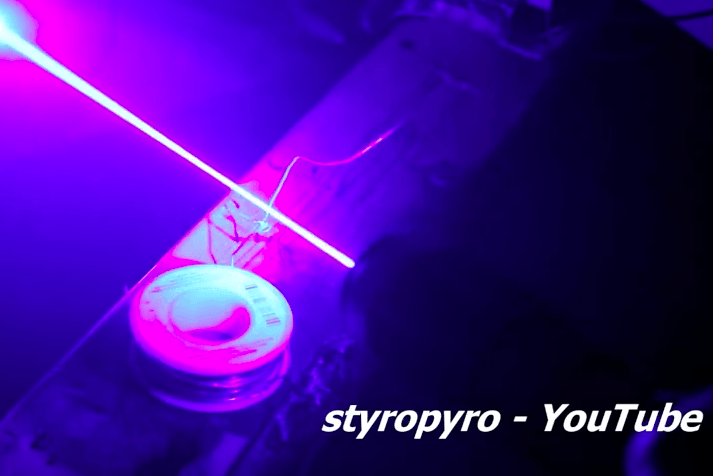 As with most of his videos, Styropyro uses the laser to burn paper, pop balloons, ignite a piece of wood, and even cut through soldering wire. Though remarkable for a handheld device, the 7W device lightsaber is not nearly as impressive as his 40W laser cannon, which uses eight parallel 5-watt laser beams and focuses them into a single 40-watt beam using a lens. The incredibly bright laser is 20,000 times as powerful as most office supply laser pointers, which produce a 2mW beam. For his next project, Styropyro is planning to produce a 160-watt laser bazooka by combining four 40-watt laser diodes. He also wants to build a ruby laser using a 1,350-carat ruby crystal and explosives.